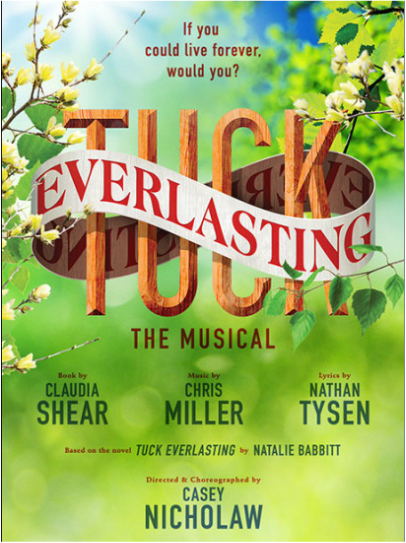 Tuck Everlasting: Would You Live Forever? ​Beautiful sets, harmonious songs and gorgeous costumes set the tone for the new Broadway show, Tuck Everlasting. The audience is swept away to the 1800's where the Tuck family discovers the secret of immortality. Through the various animated characters, beautiful sets and catchy songs we learn about how the Tuck family has learned to live with the curse and the gift that is everlasting life. The way the audience learns this is through the eyes of Winnie Foster, an 11-year-old free spirited child who is looking for fun and adventure. Winnie captivates the audience with her youthful curiosity and zeal for all things in life. Ultimately she is faced with a choice: explore the world and live forever like the Tuck Family or chose a normal life that will eventually end one day. The Broadway show opened in March of 2016 at the Broadhurst Theater and is based on the best-selling, award-winning novel by Natalie Babbitt. Direction and choreography is done by Tony Award®-winner Casey Nicholaw (Aladdin, The Book of Mormon).